If I had to summarize this article in a single sentence, it would be: “Instagram smart not hard!” Creating attractive an attractive Instagram profile is a tough job. Especially if you don’t have that much time to spare on designing each post and story you might want to get your followers to see. So why should you slave over each of your posts when there are designers out there who have done the work for you already? In this post, I have compiled .. Instagram post templates … Instagram stories templates and other design resources that I think are worthy of your Instagram profile. This post is written for people who are using Instagram as a business tool to promote their work, products, and blog posts. If you’re using Instagram to post your breakfast or some snaps from a night out, this post might not be as useful for you..but hey…maybe it can be! I’m gathering these design resources for people who know that Instagram can be a promotional asset for their business but are not quite sure how to make their Instagram posts, stories and the whole account attractive, consistent and a pleasure to maintain. All the listed Instagram templates are premium and will cost you somewhere between $10 and $26 but look at the price as an investment because you will save a huge amount of time by using pre-made templates instead of designing your own. But if you don’t feel like spending – I hope that this post will serve as an inspiration source for your own work! Instagram posts are your main tool. If you’re a photographer for example, then posting images from your shoots may surface. But if you’d like to promote a fresh blog article, attract new followers or embellish your feed with a daily quote, these templates are worth checking out. Quotes excellent post material when you know that you have to engage but don’t have anything specific to post right now. Here a couple of affordable and ready to use quote templates. Instagram Quotes Bundle by Bold Leap Creative comes with 100 ready-to-use quote posts. This means that for $11 you will get 100 jpg and png images sized for Instagram. The bungle includes images with transparent backgrounds so that you can place an image or a colored background underneath it. The pack includes positivity quotes, entrepreneur quotes, and business essentials (20% off, sale, freebie etc.) Check out Instagram Quotes Bundle here. This is a big one! Business Social Media Pack by Nebula Design Studios includes 198 ready-to-post quotes! It costs $25 and you get a set 3 sets of quotes – 1 set with black text and white background, 1 set with white text and transparent background, and 1 set with black text and transparent background. The ones with transparent backgrounds can be easily placed on top of images or patterns to make them more unique. Check out this pack here. 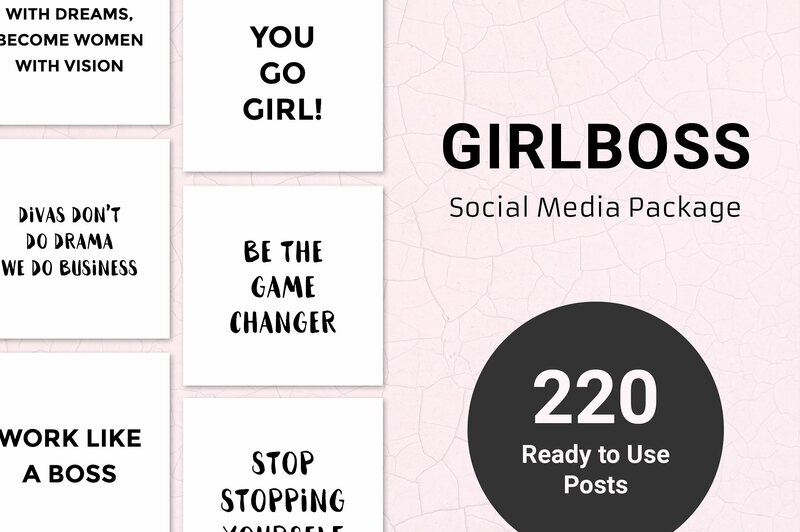 If your main target audience is female, you will love this Girlboss Edition by Annemiek! Filled with 220 ready-to-use quotes and hashtags designed for lady entrepreneurs. It will cost you $24 – so that’s $0.10 per post – not bad! Just like previous packs, this one comes with both black and white text posts with transparent backgrounds. Check out the Girlboss Edition here. Makeup & Beauty Instagram Pack is another bundle by Nebula Design Studios. This one also targets female audience but is more aesthetics-oriented than the Girlboss Edition mentioned before. For $29 you get whopping 240 quotes and just like before, all ready-to-post, with transparent and white backgrounds. The quotes in this pack are about beauty, makeup, fashion, brows, glam, melanin, and body positivity. They are written to be entertaining, empowering, positive, and most of all easy and to use. Check out this pack here. 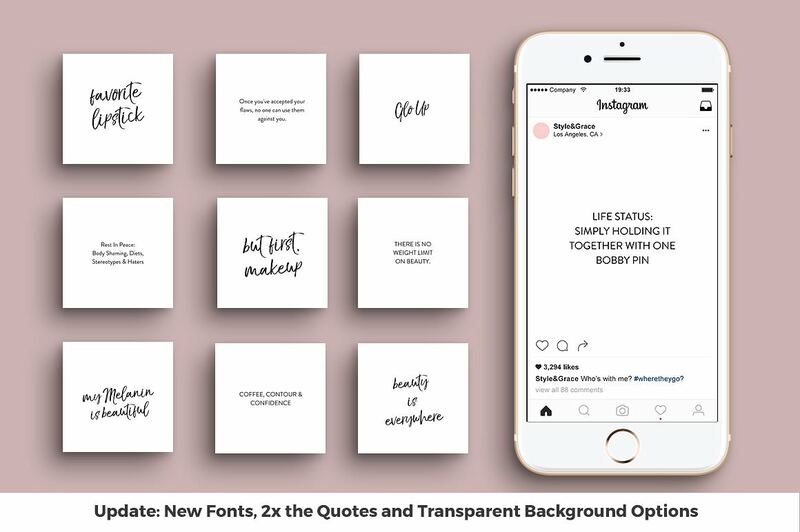 By “visual” or “image-oriented” I mean that these next Instagram templates rely on images and promotional text in some cases. Here I chose Instagram post templates that can be used as mood boards, collages, inspirational material, and promos. 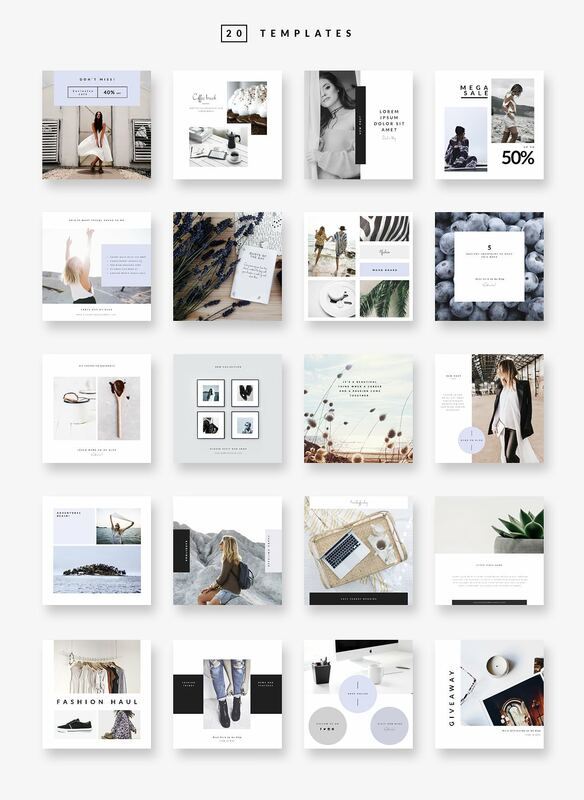 Instagram templates by Amber & Ink are designed in a collage style layout. They work perfectly as mood boards and some of the posts even include color palettes and an area for your brand name or website. For $10 you will get 10 Photoshop templates that can be edited to add your images, colors, and text. See these Instagram Templates here. 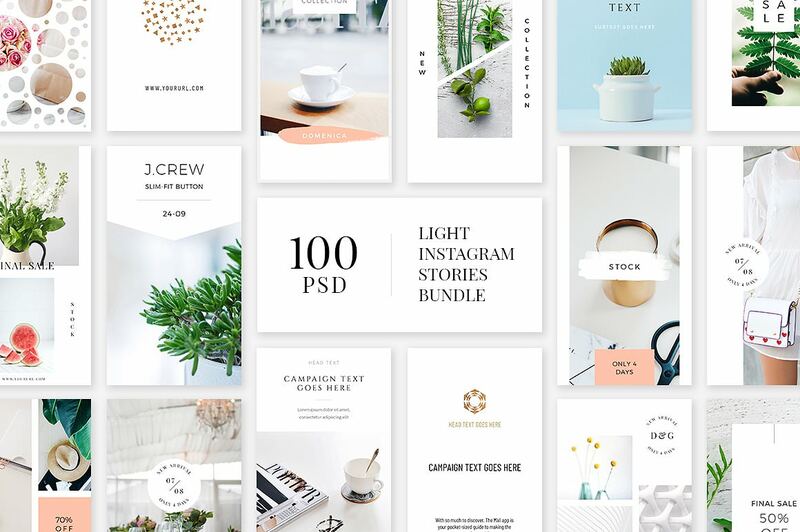 Although a bit more commercial than the previous Instagram templates by Amber & Ink, this pack by CreativeFolks is pretty visual and can be used in a number of projects. 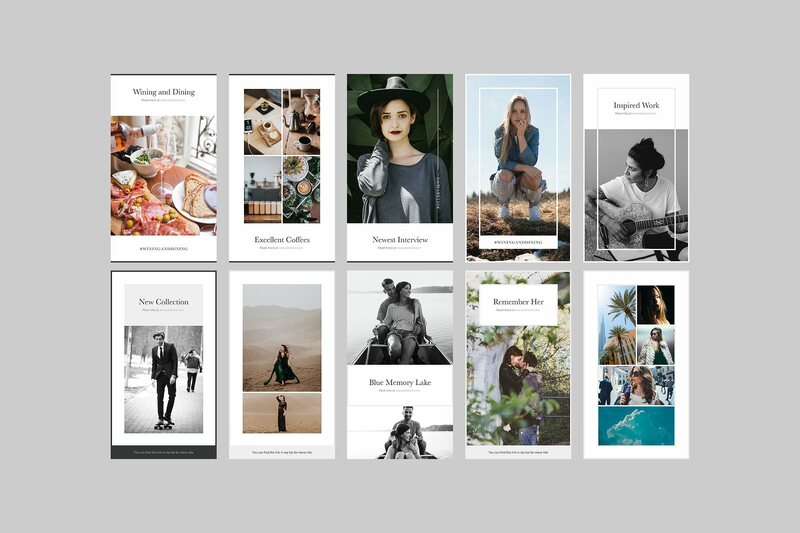 These templates would be ideal for anyone who is all about fashion, lifestyle, food or travel. Everything in these templates can be changed so you can make then suit your needs. This pack will cost you $18 and for that, you will get 20 Photoshop templates. Check out this pack here. If you’re a photographer, you will love this wedding pack by MehmetRehaTugcu. 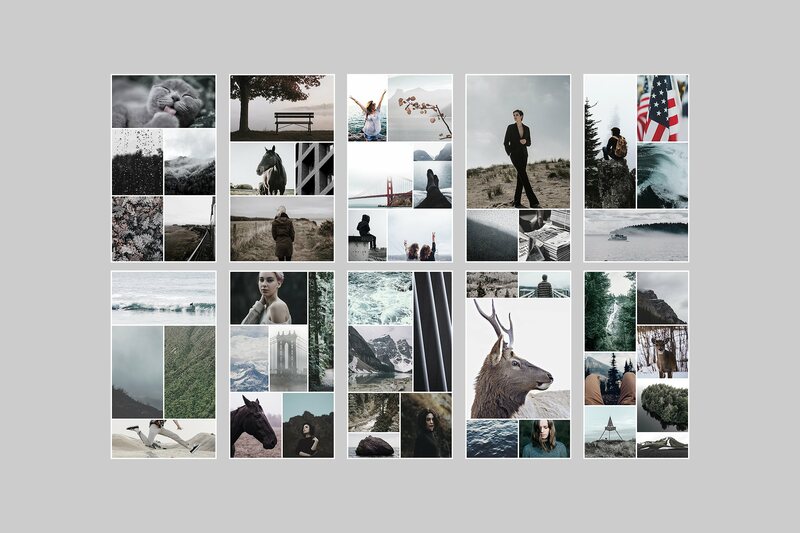 It was designed to display 1-3 images form your shoot and some words on top of the images. They would work perfectly to announce a new portfolio gallery or blog post on your website. So if you want to increase traffic to your website via Instagram, this pack might help! For $20 you will get 24 Photoshop templates with alternate color styles and a couple of Photoshop actions for a fast color change. 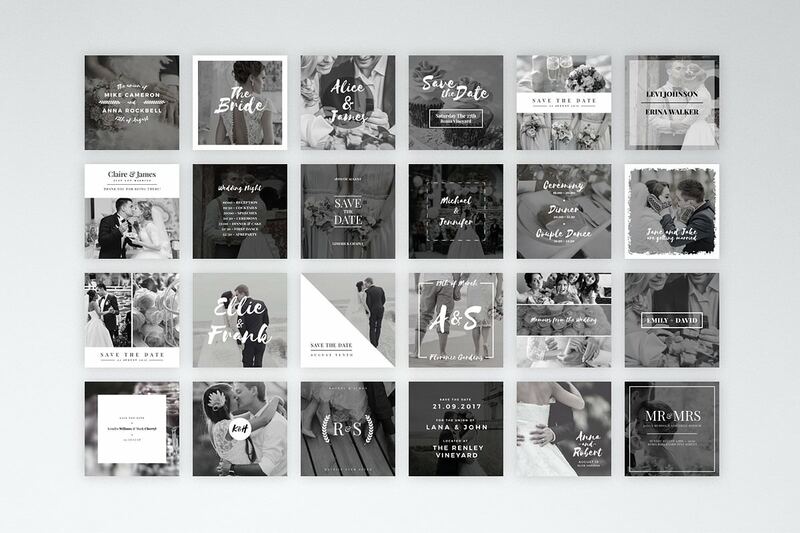 View Instagram Wedding Pack here. 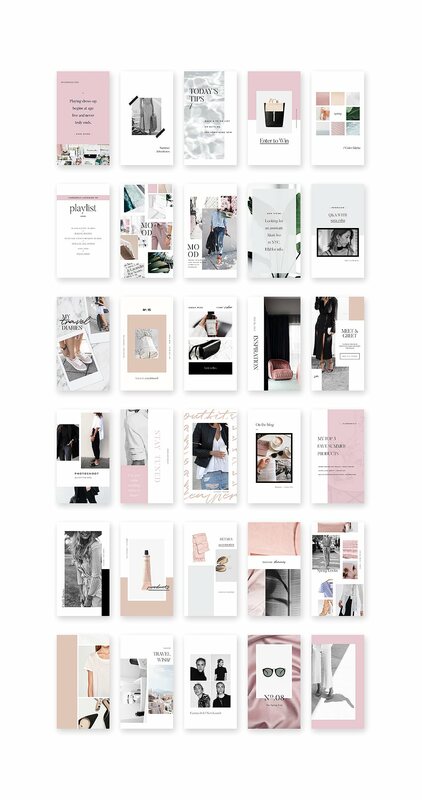 Another Instagram template pack by Amber & Ink. These 10 Photoshop templates for $10 are beautifully chaotic yet pleasant to the eye. 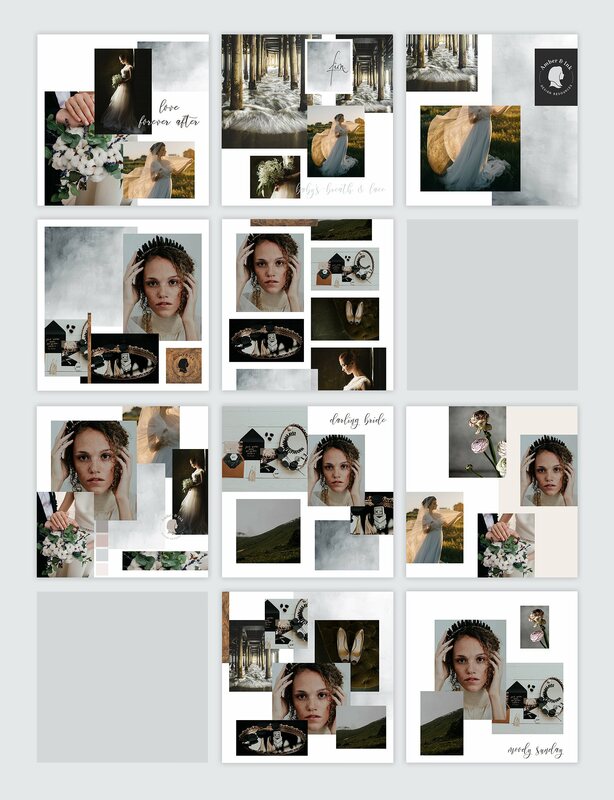 These Instagram templates would work perfectly for photographers, designers who want to show off their mood board for their latest design, fashion, lifestyle bloggers, and design studios. 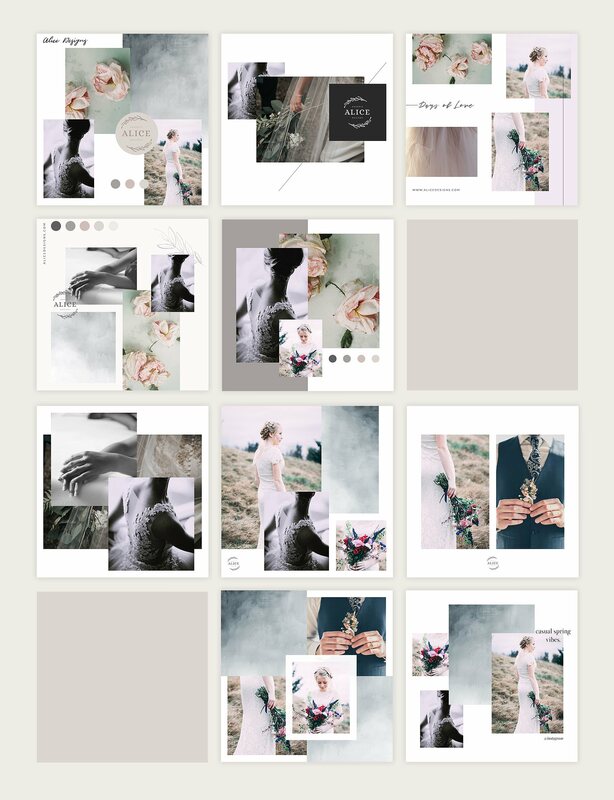 See Instagram Post Templates – Mood Boards here. This bundle by 46&2 Collective is a bit different than the other ones. Naturalis templates are not only for Instagram (1200x1200px) but also for Facebook and Pinterest (1200x628px and 1200x1500px). For $26 you get 36 templates in various sizes so that you can upload them to other social media site. 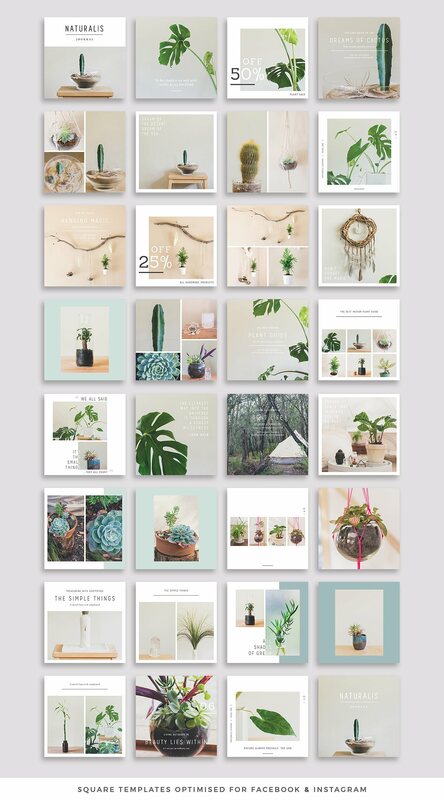 Another cool thing about these Instagram templates is that the images are included as well! Check it out here. Another great bundle form 46&2 Collective. 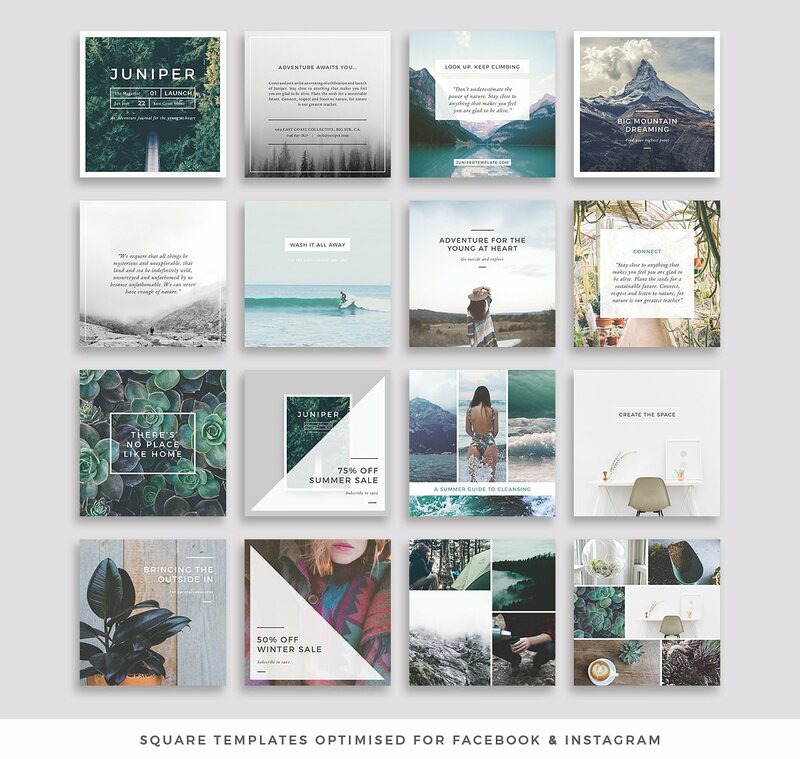 This one will cost you $22 and it includes 16 Instagram templates for Instagram, Pinterest, and Facebook. They are all customizable, fonts and images are included but can be changed as well. You will be able to edit these in Photoshop and InDesign. Check out Juniper bundle here. 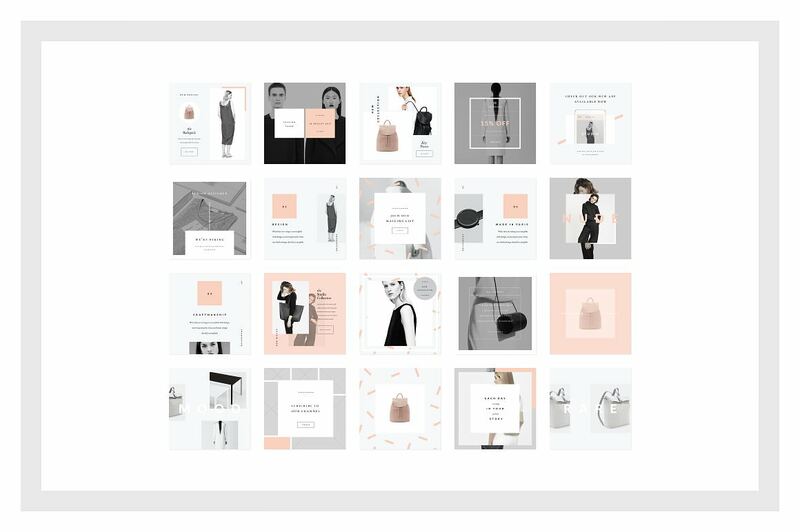 If you have products to sell, then you will love this Fashion Social Media Pack by Studio Standard. For $22 you will get 20 templates that can be edited with Photoshop. This pack includes everything a retailer would need – “Shop this item” post, “Discount code”, “Mailing list”, “Quote”, “Mood” post, “Key piece” posts and more. Check it out here. 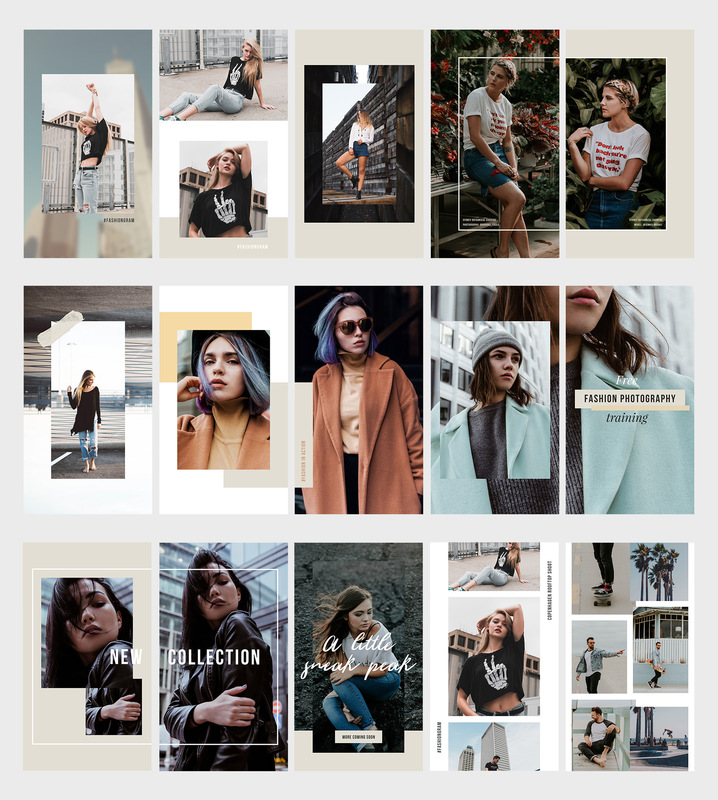 If you’re serious about your Instagram game and want to go all in – check out this Animated Instagram Pack comprised of both post templates and story templates. It also comes with ton of beautiful, hand-drawn graphics and slogans such as “Sale”, “Insta”, “Mood”, “Love”, “2018” and many more so make sure you check out this gem here! Instagram stories let you post images and video that disappear after 24 hours. Stories appear in a bar at the top of your Instagram feed and can be viewed by tapping on them. Since they disappear within 24 hours of posting, they are great for limited time discounts, to boost traffic to a fresh post or video on your blog or to engage with your audience in a more friendly, intimate manner. These templates below can be edited with Photoshop CS6 or higher so you should have some knowledge of it before you choose any of these animated Instagram templates. Animated Stories by Kristina&Co are eye-catching, lovely and come with free watercolor brushes for Photoshop. These 20 video templates will cost you $26 and they come with 2 video tutorials.If you decide you don’t want to animate these stories, you can easily use the designs as static images as well. Check out these stories here. Copper Stories by Ruby&Heart also costs $26 and come with 20 templates. A great thing about these templates are that you can download a free test kit form the product page before you purchase. Copper Stories also come with a tutorial to help you edit. Check them out here. 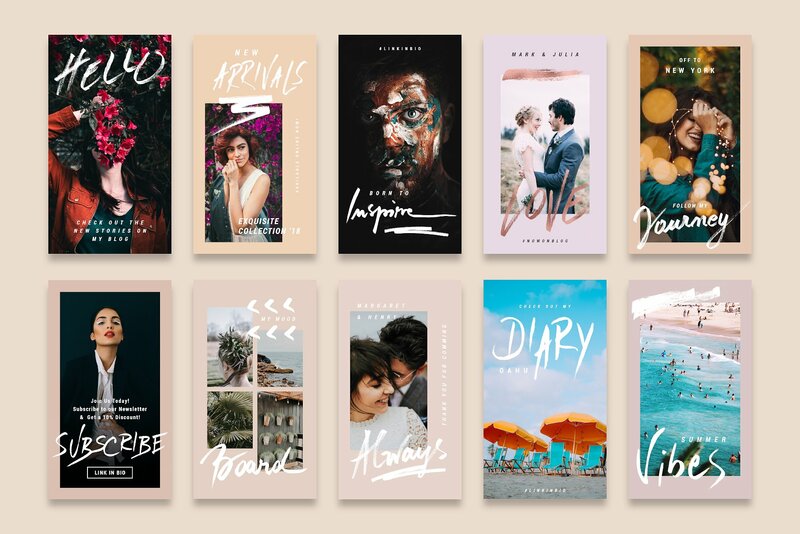 A rather feminine, rich stories pack by CreativeFolks. These 20 animated stories (+ 20Static templates) for $26 are great for fashion, lifestyle, travel Instagramers as well as designers and creatives. Check out these stories here. Another pack form CreativeFolks – Pastel Blue. Just like the one before, it will cost you $26 for 20 story templates and it includes 20 static Photoshop templates as well. Paster Blue uses free fonts and everything from images to colors can be changed to suit your Instagram feed. Check it out here. 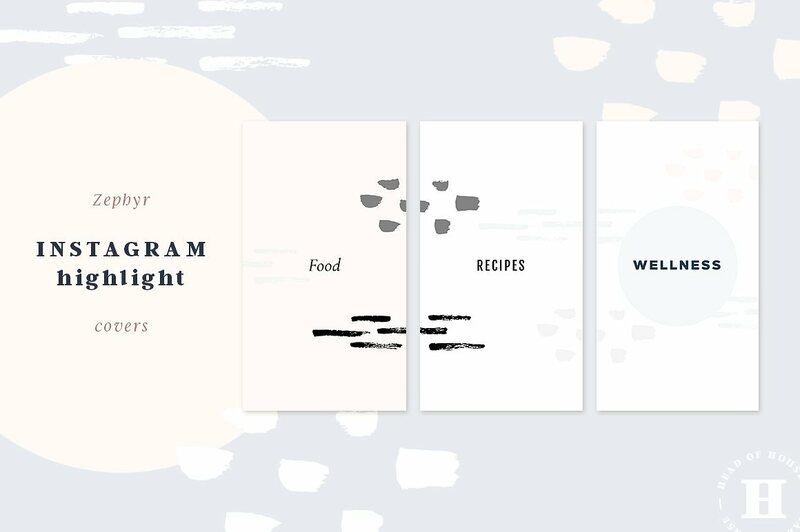 These Instagram story templates by Ruby&Heart are just lovely! For $26 you get 20 templates. They’re bright, fun and come with a bunch of vector graphics for you to use. Just like other animated Instagram templates form Ruby&Heart, you can test drive these templates for free! Check them out here. These 20 Instagram story templates also cost $26 but they have a great bonus added to them – 25 hi-rez watercolor backgrounds and 3 images that you can use as your own! Check our these Artistic Stories here. If you’re looking for something clean and simple that would fit nicely with your Instagram style, check out these Minimalist stories. Again, for $26 you get 20 story templates. These are especially nice because they look clean, professional and quite classy. Check them out there. Promote your business to your female audience with these 20 animates story templates by AgataCreate. They will also cost you the standard $26 but these ones also include 16 hand-drawn icons and 9 watercolor graphics. View these stories here. If you’re looking for creative story templates but are not comfortable with video features in Photoshop, static stories might be better suited for you. Plus they are a bit cheaper (per story) to buy than animated stories. Here are my favorite picks for static Instagram story templates. 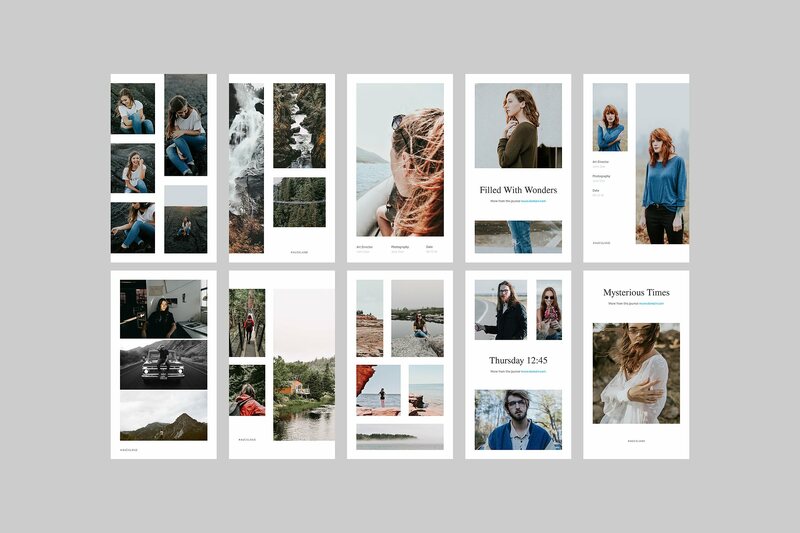 Light Instagram Stories Bundle by Swiss_cube is a giant 100 Instagram templates pack that costs $30. It actually consists of 5 separate stories packs that can be purchased all together. This bundle will be a valuable asset to anyone who posts stories a lot. The designs are clean, creative, and professional. Check it out here. If you’re looking for image oriented story templates – these templates by Ruben Storm are what you need. These 20 editable Instagram stories all consist of different tiled layouts that you can fill with out images and graphics. This pack will cost you $16. Check it out here. Another one from Ruben Storm. This 20 templates pack also costs $16 but includes areas for a bit of text as well. This pack might be suitable for photographers, life coaches, bloggers, and small business owners. Make sure you check it out here. Last one from Ruben Storm is called Tuscany Instagram Stories. This one also comes with 20 editable templates and costs $16. Somewhat similar to the Auckland pack yet a bit more delicate. I imagine this one working beautifully for food and recipe bloggers, lifestyle and travel bloggers, and anyone who wants to promote their online courses. See it here. 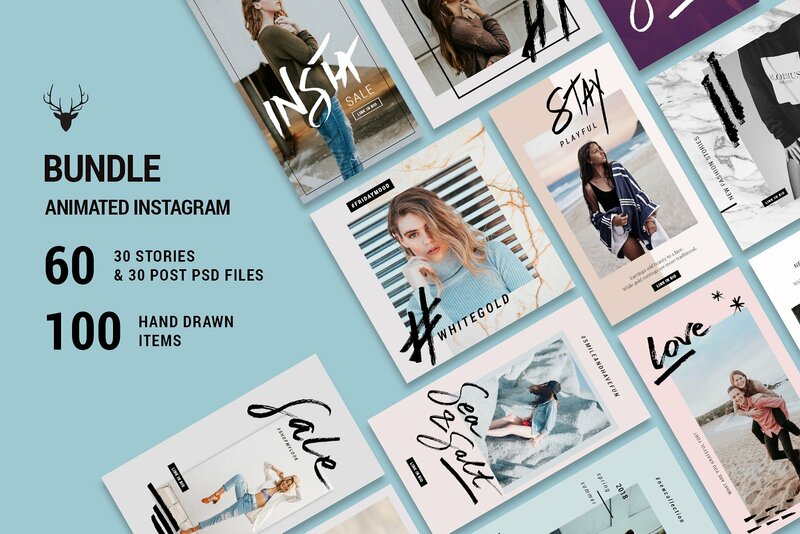 This Instagram stories pack by Amber & Ink comes with 15 editable Photoshop templates and costs only $12. What’s interesting and unique here is that this pack has templates that work as slides. When posting Instagram stories, you can post multiple images to create actual storytelling. This pack has 4 tillable templates that are bound to catch the eye of your followers. Check this pack out here. 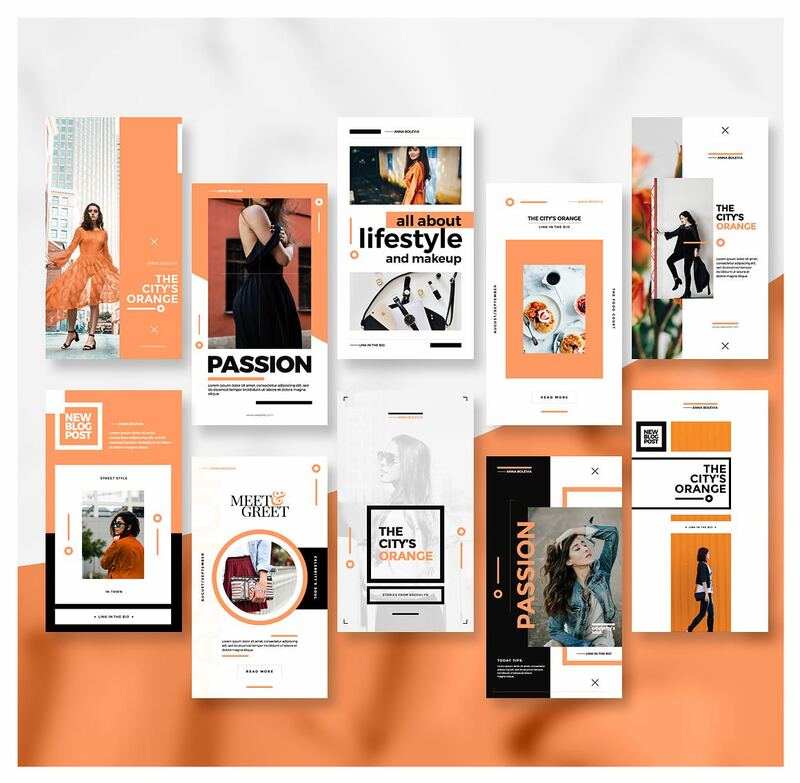 If you’re a fashion, lifestyle, product blogger, or influencer you will love this pack by Design Love Shop. It consists of 30 editable Photoshop templates and costs only $20! It has everything you might need – mood boards, collages, details, new product posts, text posts and image posts. Check it out here. If you’re looking for something bright and bold, you might like this Passion pack by Onurcan Erdem. It has 10 templates and costs $16. You can see it here. One of my current favorites – Rose Gold Stories. I love this pack because it not only comes with 30 fully designed story templates but also more than 200 hand-drawn elements such as hearts, stars, lines, triangles, exes and all kinds of trendy wording. 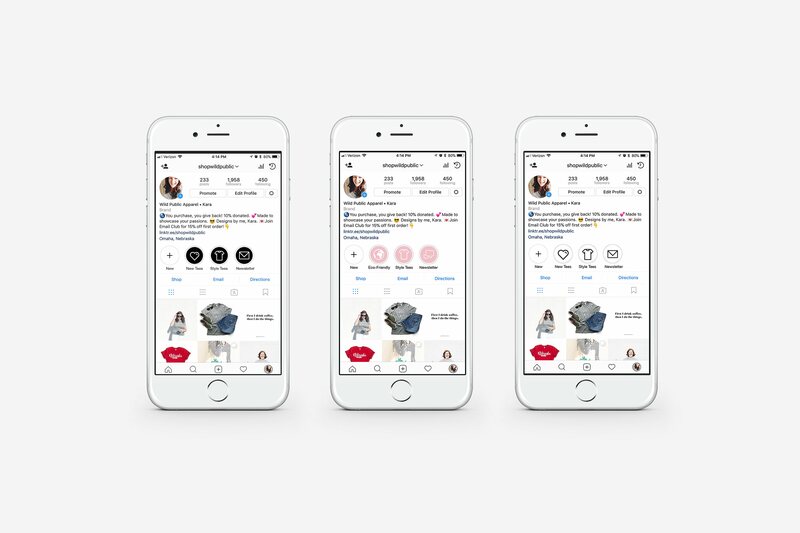 This means that you can create your own designs not only for Instagram but for other platforms and even print! The whole pack costs only $19 and you can view it here. Unlike regular Instagram Stories that vanish after 24 hours, Instagram Stories Highlights are curated clips grouped together by you and live permanently on your profile until you delete them. They appear directly under your bio and above your Instagram feed and will play as a stand-alone story when someone taps on it. 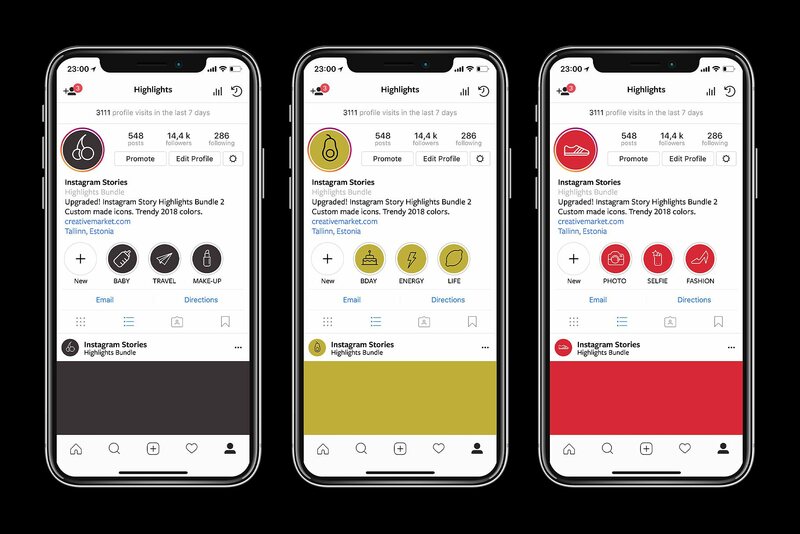 If you want to make sure your best stories stay put but look nice on your profile as well- check out these Instagram highlight templates. This Instagram stories icon pack consists of 20 designs by Em & Dash for $20. This pack comes with both ready to use images in pink, white and black as well as Photoshop and Illustrator files so that you can customize the images to your linking. Check it out here. This pack consists of 25 x 3 designs for only $6! Just like the previous pack, this one has both ready-to-use images and a Photoshop file for customizations. The ready-to-use packs have 25 emoji icons, marble backgrounds, chalkboard background and green leaf background. you can also use the Photoshop file to add a custom background image and icons if you want to. Check it out here. If you’re looking for simple icons and bright colors, this bundle might be what you need. It has 80 icons and 26 colors included and Photoshop file for editing. It’s a bit more expensive than other packs – it will cost you $29 but is sure to cover all your story cover needs. Check it out here. These templates by Head of House 36 x 3 ready-to-use templates with english words and 3 blank templates to add your own text. It costs $12 and includes a guide to help you edit and use these templates. Check them out here. 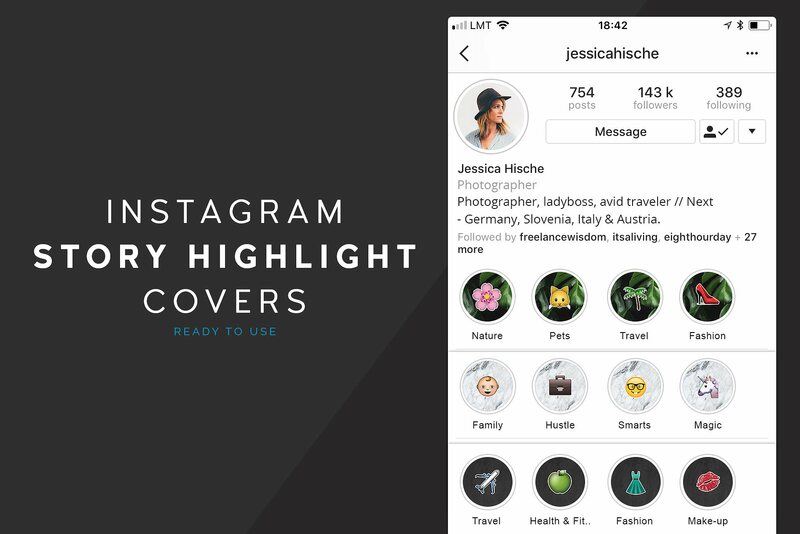 Instagram Stories Highlight icons by Kristina D. costs $9 and included 18 ready-to-use templates as well as a Photoshop template for customizations. Icons include beauty, flowers, fashion, travel, work weddings and more. Check them all out here. 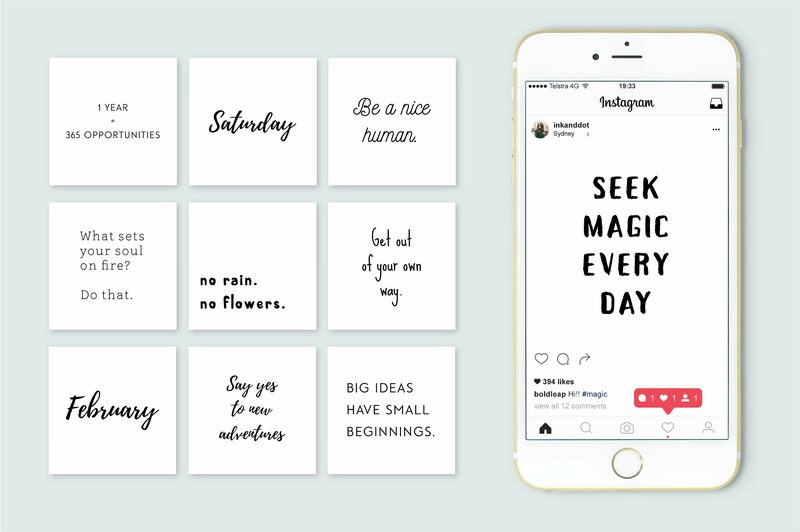 I hope you found these templates useful or at least inspirational and now you’re ready to pretty up your Instagram profile. If you use any of these templates, shase your Instagram handle in the comment section and let the world discover you!